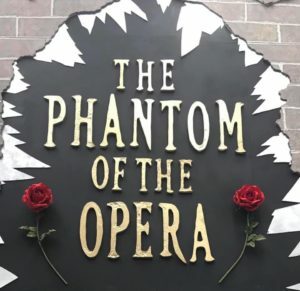 UPDATE: During the performance of the Phantom of the Opera, at Patuxent High School, a rolling set piece with the student playing the Phantom inside of it was pushed down the aisle, tipped over, and fell on two audience members. Emergency services were called. The student playing the Phantom and two audience members were transported to the local hospital and have since been released. The set piece had been used in rehearsals since early March, and students were trained to move it over the course of several weeks. Last night, the structure was tested prior to the show, as all set pieces are inspected every night to ensure the safety of actors, techs, and the audience. As the techs were moving it into position, the structure became off balance and tilted forward. While the descent was slowed by another structure, the set piece injured two audience members, and the actor fell into the audience. The structure was then moved to a safe location on stage and inspected. Mrs. Bergen, the principal, wants to thank the CCPS and PHS staff members who quickly jumped in to help. In response to the support, theater teacher Mr. Price said, “I have never felt greater love and connection to the community of Southern Maryland than I did last night.” Mr. Price, the staff, and students did an extraordinary job calmly responding to this incident. 4/13/2019: On Friday, April 12, 2019, at approximately 8:20 p.m., fire, and rescue personnel responded to Patuxent Highschool, located at 12485 Southern Connector Boulevard in Lusby, for the reported injuries after a stage collapse. Dispatchers advised there was not a stage collapse after they received multiple 911 calls, stating some sort of prop from the play fell and hit people in the audience. Three subjects were transported from the scene to an area hospital with unknown injuries. This entry was posted on April 13, 2019 at 10:49 am and is filed under All News, Calvert News, County, Fire & Rescue, Law Enforcement, Top News, z 600X120 Top Ad Bottom, z 600X120 Top Ad Top. You can follow any responses to this entry through the RSS 2.0 feed.